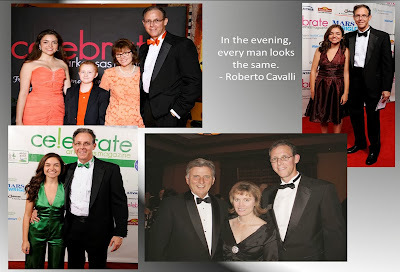 My husband prefers to wear a tuxedo for evening events. 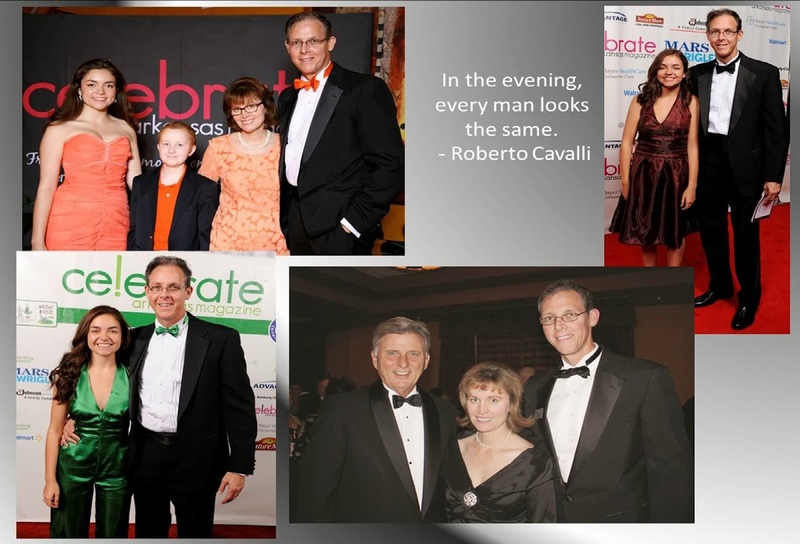 Even if they're not specified as black tie events, if it's after six, he's in his tuxedo. I do believe that it is always better to be over-dressed than under-dressed, and I'm quite impressed that he can still wear the suit he wore to our wedding! Not to mention how easy it is to put an outfit together for a formal affair. I'm envious. He usually wears the traditional black tie, but for the last two "Color" events he has asked me to make a bow tie to match the color theme. Last year, I made a green tie using the same satin as my daughter's jumpsuit, using Angela Osborn's free pattern. It's a good pattern, with great instructions, but it probably would work better with a cotton fabric that isn't slippery, since it is a tie that needs to be tied on the wearer, not one with adjustable hardware that just snaps in back. Of course it was a last minute thing, and we really didn't have time to re-make it after realizing that it was on the small side. A little small, but really not too bad. This year, I pressed him to wear a suit with a "normal" tie -- "you can find an orange tie at Dillards," I suggested. Nope. He just bought a new tuxedo shirt, and was insistent that he would wear his tuxedo. "Besides, I want to match you." For the tangerine tie, I decided to use a commercial pattern (Vogue 7104) which is adjustable, but requires hardware. I ordered the hardware from WAWAK, with a couple of weeks to spare. A couple of weeks is really planning ahead for me. Apparently not far enough, though. The package arrived from Fed Ex a couple of days after I placed the order, empty! The envelope opened during shipping and the contents were lost. No problem, they can re-ship it, we still have more than week before the event, right? Nope. The hardware was back-ordered. So I made Angela Osborn's version again, this time a little bigger. Steve decided that it needed an extra 2" in length. That seemed a bit excessive to me, but he's usually good at estimating. We both thought the width of the bow needed to be expanded slightly, as well. 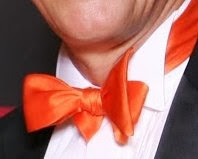 The orange silk charmeuse that I dyed for my underlining was so striking, and he really wanted it for his bow tie. I thought it would be nice for it to be seen, since it really wasn't all that noticeable as an underlining. The charmeuse was slip-slip-slippery -- as any idiot would expect -- and a little too floppy for a bow tie. I underlined it with silk organza to give it some structure (I don't really like the look of a fusible behind silk). I added 2 inches to the length, and an extra 5/8" to the width. It came together rather quickly, although cutting small pieces of charmeuse on the bias is a bit fiddly. It took me even longer (almost an hour) to tie it! The silk was so slippery, the length was a bit too long, and the width was slightly clownish (at least on the tail end -- you can see below). But it was the day of the event, and I couldn't talk him into going back to his black tie. This was probably the best it looked all night! Since it was so slippery, the tie moved all over his neck throughout the evening, requiring constant re-tying and re-positioning. At one point he came out of the men's room and mentioned that it was hideous. I laughed (but had to agree), and re-tied it. It looked good for another 20 minutes. My bow tie hardware from Wawak arrived about a week after the event -- a full dozen sets of bow tie hardware. So I will eventually try Vogue 7104. I'll wait for everyone to forget about the tangerine tie, though. haha - the tie that won't be tied! Both versions are so very smart - I love seeing the colour against the formality of the tux! Dreaming of Sewing "The Couture Dress"
Orange-you glad Vogue 8766 is finished? !